We have three cabins at the Raymond Store property which is located on the Middle Fork of the South St. Vrain River nestled in the secluded town of Raymond, Colorado. 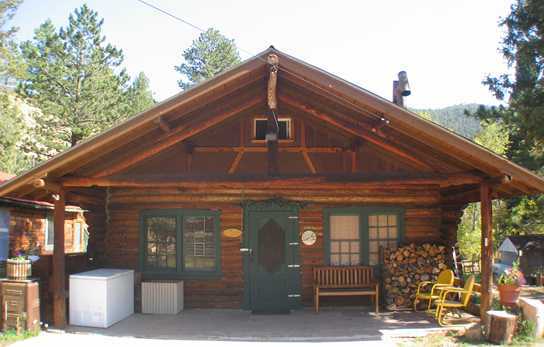 The Middle Fork log cabin was built in 1918. This cabin has 2 bedrooms with a capacity to sleep up to 6 people. Whether you are looking to spend a day on the back patio next to the river or a cozy winter day in an old time mountain cabin next to the fireplace, the Middle Fork Cabin is ideal. The Aspen Leaf and Bunk House are cozy cabins for two, equipped with everything you will need for your stay in the mountains. The front porches open to a wonderful view of the Raymond valley that offers hiking, fishing, horseback riding and close to the excitement of Estes Park and the RMNP.